Columbus Small Animal Hospital was the first in the nation to install a next-generation Rayence DR digital X-ray imaging system. The wireless system makes use of an adjustable table that lowers to the ground, making it easier and safer to accommodate pets. 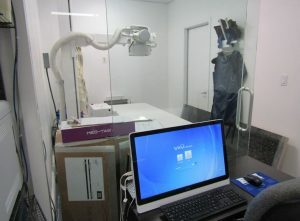 The system improves diagnostic capability and outcomes. The table system is revolutionary. It delivers silent elevation for comfort and stability. Because it lowers to the ground, animals that should not be lifted or moved much can be positioned for X-ray imaging with ease and maximum comfort. More on our YouTube channel. The Columbus Small Animal Hospital offers the latest in ultrasound technology. Ultrasound scans are painless and extremely safe. 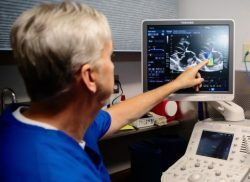 Ultrasound gives clear, instant, real-time moving pictures of soft tissues and shows images that do not show up well on X–Rays. Ultrasound is a good tool to examine your pet’s abdominal organs and for assessing heart function. It is exciting to watch a heart beat in real time with the different valves opening and closing and be able to measure blood velocity, wall thickness, lumen size and other parameters that are necessary for accurate diagnosing and treatment of heart conditions in dogs and cats. Very few veterinary facilities anywhere around here have this level of capability. We are connected to veterinary experts across the country with instant communications. We often send images and case information to Board Certified Radiologists, Cardiologists, Dermatologists, Ophthalmologists, Internists and other qualified experts for collaboration on our cases. We have warm reciprocal relationships with these individuals and groups as we partner with them enhancing our efforts to bring exceptional quality in veterinary diagnostics and treatment to this area. We work with some of the finest and most respected veterinary experts in the country whom we know well. We give our clients and patients access to this level of highly informed specialists who evaluate and render opinions on individual cases with no travel for our clients and little expense. We do this in order to get the right answer and to do the right thing. When we take x rays, do ultrasound studies, run lab work and make diagnostic and treatment decisions we know that highly qualified, nationally known, Board Certified experts are looking over our shoulders evaluating our work – because we invite them to. We work very hard to earn and to keep their respect. We highly value their significant contributions to our efforts – contributions that show in the outcomes of the cases we handle.